Blue Stretch Denim Jean Shorts Size 00 (Bermuda Mid-Rise) Mossimo Supply Co. Shorts Length: Above knee. Made with Repreve (Polyester fiber with recycled plastic bottles). Power Stretch. Material: 70% Cotton/28% Repreve Recycled Polyester. Girls Jeans Shorts Pants Lot Size 00. Condition is Pre-owned. Shipped with USPS Priority Mail. I would never purposefully call an item brown if I am seeing it as gray.I am simply describing a color as I am seeing it. Pretty Floral Print. Size 00 - Waist: approx 14" flat, Hip: 18" flat, Rise: 11.5", Inseam: 4.5". Condition is Pre-owned but like new. Women’s JCrew Shorts Animal Print Size 00. Condition is Pre-owned. Shipped with USPS First Class Package. Aeropostale Bermuda Shorts Size 00 Medium Wash Stretch Denim. Condition is Pre-owned but very good. Shipped with USPS Priority Mail. These are flawless and like new. Lilly Pulitzer The Walsh Short Women's Sz 00 White, Coral, and Blue Crap Print . Shipped with USPS First Class Package. Womens Hollister Denim Shorts Size 00. Condition is Pre-owned. Shipped with USPS First Class Package. Gently worn, very minimal color fade but it’s hard to photograph dark color. Super soft almost sueded washed lightweight material, great for spring and summer! 10” inseam. J.CREW Women's Size 00 Bermuda Shorts Navy Blue xxs. Condition is Pre-owned. Shipped with USPS First Class Package. Womens Abercrombie & Fitch Size 00 or 24 Black Denim Jean Shorts High Rise. Condition is Pre-owned. Shipped with USPS First Class Package. They are White and Blue in color. They are in excellent condition. Sold as is. 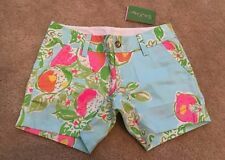 Lily Pulitzer Shorts Size 00. Shipped with USPS First Class Package. Fantastic condition, only worn once or twice. Shorts are a dark wash denim. Distressed front and back. 78% Cotton\21% Polyester\1% Elastic. Size: 00 Waist: 23". Light Wash.
express shorts 00. Shipped with USPS First Class Package. Shorts are in Excellent Condition. waist across 15". Aeropostale teal shorts size 00. Condition is Pre-owned. Shipped with USPS First Class Package. White House Black Market Sailor Shorts. 13" flat lay waist. No holes, stains or excessive wear. ANTHROPOLOGIE DAUGHTERS OF THE LIBERATION PEAR PRINT SHORTS. 13" LENGTH. GOOD PRE-OWNED CONDITION, SHOWS SLIGHT/NORMAL WEAR, NO MAJOR FLAWS. MISSING SASH/BELT. American Eagle Jean Shorts. Condition is Pre-owned. Shipped with USPS First Class Package. Shorts both size 00 Tops are size small Great shape like new aeropostale girls Size 00. Condition is Pre-owned. Shipped with USPS First Class Package.